It is estimated that illegal logging is responsible for up to 90 percent of destructive deforestation in the rainforests. These activities have many negative and long reaching impacts on the environment. Trees play a critical role in regulating greenhouse gasses, which are linked to climate change. Deforestation disrupts the water cycle, as trees are no longer able to absorb and return water to the atmosphere. Logging also destroys the habitats for millions of the species of plants and animals that rely the forests for their survival. The most common method of tracking deforestation relies on satellite imagery to determine where these activities are happening. Unfortunately this method falls into the “a little too late” category. Rainforest Connection, a company out of San Francisco has taken a more proactive approach to protecting and preserving the rainforests. Their aim is stop illegal logging before large portions of forest are decimated. To accomplish this, they have developed the first real time logging detection system. By using some of the 150 million annually discarded smartphones, they set up networks of monitors that listen for sounds of illegal logging activity. Unwanted cell phones are collected and converted to run solely on solar power. 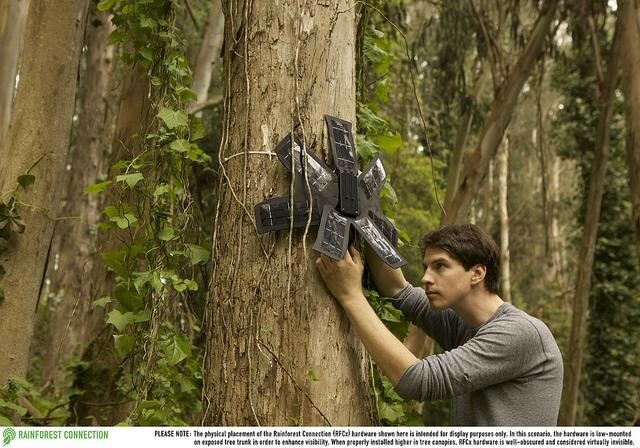 Sophisticated software that is designed to recognize the sounds of illegal logging is then loaded onto the phones. These now autonomous devices are placed high in the canopy, where they are able to detect illegal logging from up to 1 kilometer away. 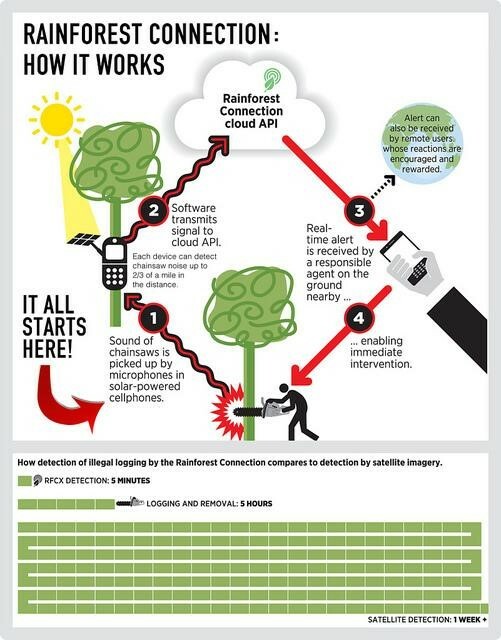 Using the standard GSM cell phone network, the devices report any logging activity they detect to the cloud. This information is immediately available to the appropriate authorities, who are able to quickly intervene. The Rainforest Connection system has been put to the test in an endangered area of forest in Sumatra. Within the first day of the set up, the system reported its first sounds of illegal logging. Rainforest Connection is now looking to expand by putting next generations devices in rainforests of Indonesia, the Amazon, and Africa.